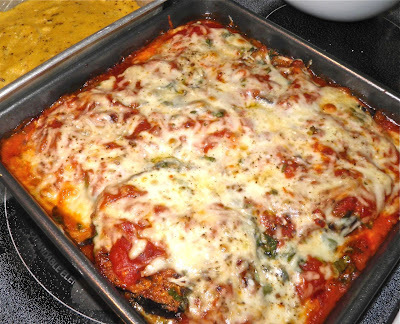 Devoid Of Culture And Indifferent To The Arts: Roadside Recipe: Parmesan-Crusted Eggplant "Lasagna"
Roadside Recipe: Parmesan-Crusted Eggplant "Lasagna"
This dish is excellent – even with no meat and no noodles. At least 90% of what we watch on TV lowers our IQs. The pap that we’re fed conspires to make us less curious about life outside us. It’s easy to get caught up in the "voyeurism for pay" that passes for network TV. It’s like we’re living in the last, decadent days of the Roman Empire. It wouldn’t surprise me if there was a horse elected to senate sometime soon. I would bet there’s at least one (or a “rear portion” of one) appointed in the Canadian Senate already. An excellent way to use eggplant. These are ready for baking. In it the host, Bob Wilson, parks his truck alongside roads in New England and posts signs to ask ordinary people to stop and tell him their stories. Manufactured celebrity like we see on The Kardashians and Jersey Shore hold no appeal for me. But the stories of triumph that live within each one of us are a different kettle of fish. Each one of us is the hero in our own life drama. One such person stopped to talk on an episode aired a few weeks ago. She had faced and won severe health trials in her life. The obvious love and support from her husband made the story even more endearing. They were a couple we should all strive to emulate. She took the host back to her home where he talked with the two of them about their life. But rather than go on about the hardships in their life they opted to focus on their garden and the simple joy they garner from setting spade to soil. They look tasty, don't they. Their garden was their jewel, where supplemented their lives by growing some of their own food. That day they were in the process of putting some up for the winter. They had just canned tomato sauce. Through the conversation recounting their lives she assembled a version of the dish I am posting today. 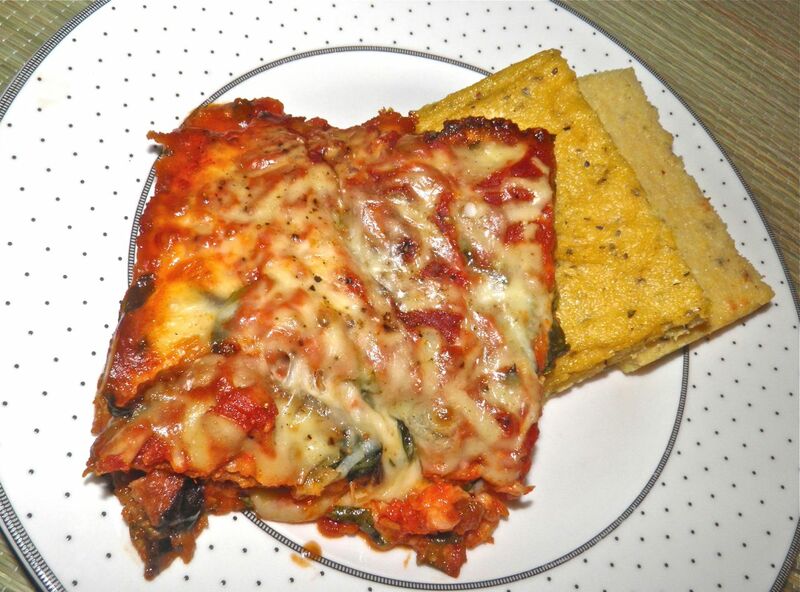 The assembled lasagnas were to be frozen for nutritious, easy family dinners later on. It looked fantastic. 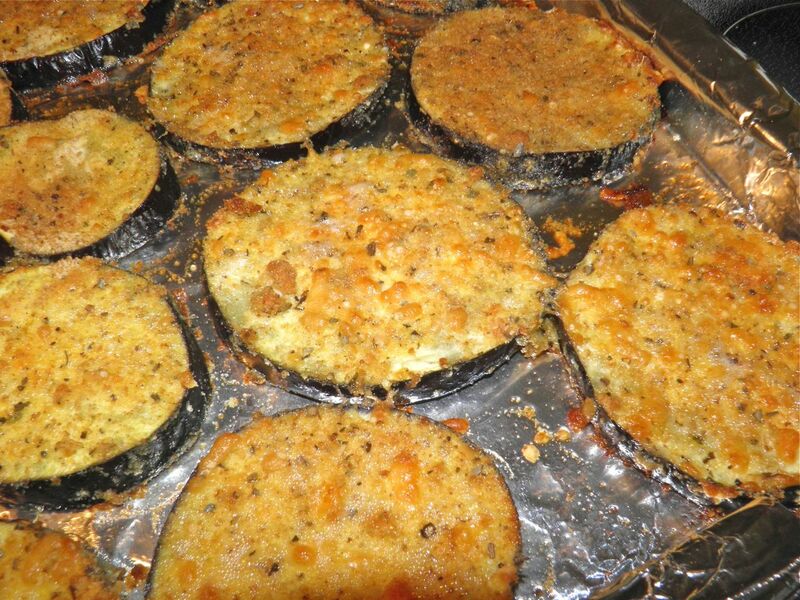 Crusted slices of eggplant, simply layered with sauce, cheese and herbs. They were an inspiring couple. The host took home a whole tray of this delicious concoction. I discovered, upon following her sparse outline, that it truly is an amazing meal, full of wonderful flavours. Uncomplicated is always best in any food and this is a prime example. Of course I took some liberties (provolone, tons of basil) but they certainly don’t detract from the joy you could tell was an unspoken ingredient in their cooking. The 9" x 9" pan was full to the top. Preheat the oven to 400°F. Line a baking sheet with foil. Rub the foil with a good amount of olive oil. Make two plates for bound breading. On one plate crack the eggs and mix with a fork. Add some salt and pepper. This dish is most definitely going to be made again. 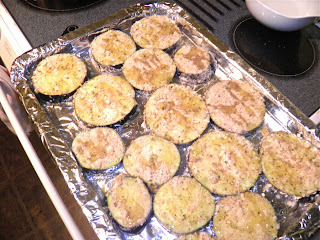 On the second plate combine the bread crumbs, 1/2 cup of the grated parmesan, oregano and a little salt and pepper. Rub the parmesan into the mixture with your hands to break it up well. It’s best if you can find an eggplant that is equal thickness along its length so the slices are equal size. Slice the eggplant and dip each slice first into the egg and then the bread crumbs. Place each slice on the foil lined pan until all are breaded. Drizzle a little olive oil on top of each slice. Bake in the oven for about 25 minutes, until golden brown on top. To make the lasagna, place a small amount of sauce on the bottom of the pan. Place half the eggplant slices on top, then more tomato sauce, half the basil and half the provolone. Repeat for the second layer – eggplant, sauce, basil and provolone. Sprinkle the top liberally with cracked black pepper and the remaining 1/2 cup of parmesan. 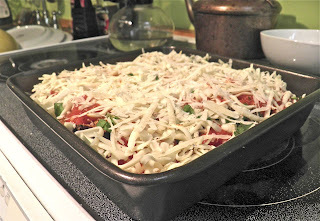 Bake in the oven for 30 minutes, or until browned and bubbly on top. Serve with polenta or with spaghetti.